I am a city girl, but I felt at home on the Stafford Ranch. 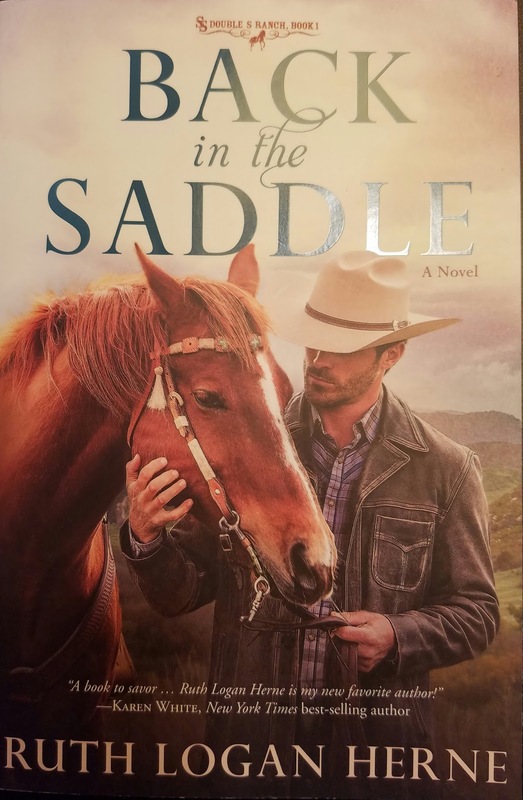 Back in the Saddle by Ruth Logan Herne introduces us to Cole Stafford, Sam Stafford and Angelina Morales. Cole Stafford did not feel the ranch was his home so he left many years ago. He became successful at a Wall Street investment firm instead of the cowboy he was raised to be. Cole is the son of Sam Stafford who has made the Double S ranch successful. Their relationship is strained to say the least. The last thing Cole wants to do is go back to the ranch when he has financial trouble. When Cole returns, he discovers that his dad is different. It takes time for Cole to understand that Sam Stafford has changed for the better. Sam's housekeeper, Angelina, reminded him what is most important and that the Lord should be first. Angelina is so much more than a housekeeper. She is tough and sweet and is hiding from her past. Cole and Angelina are attracted to each other, but their budding romance is challenged by their past and what the future might hold for the both of them. Cole's return is like the story of The Prodigal Son as described on the back cover of this book. Another story also came to mind while reading Back in the Saddle. I was reminded of the Christmas Carol because Sam Stafford was like Ebenezer Scrooge. He did not treat people right as he climbed the ladder of success. After he started following God, he was trying to figure out how to make amends with his family and the community. I enjoyed this story, the characters, the romance and the ranch. Yes, even the ranch seemed inviting to me. The long days and the hard work does not sound that exciting, but it was real and wholesome. The romance was sweet and learning how to trust in the Lord by everyone was honest. A better definition of success was realized by Cole. It is not measured by the amount of money you make, but by loving others and committing to their success. I am definitely reading the second book about Cole's brother, Nick. You can read more about the author, Ruth Logan Herne on her website. I received this book from Blogging for Books for a review. A Refuge in Highland Hall by Carrie Turansky is a wonderful story set in Britain during World War I. It is the third book in the Edwardian Brides series. I suggest reading the first two books to understand the other characters better, but this book can be read on its own. Penny Ramsey meets Alex Goodwin who is a friend of her brother-in-law, Jon just before he becomes active in the war. You can read more about Jon and her sister, Kate in The Daughter of Highland Hall. Through letters, Penny and Alex become friends and a source of comfort as the war continues on. Penny gives him a place of refuge in her letters because he is not close to his mother. Penny fills in the gap where family should have been. Her letters are thoughtful and filled with scripture that helps Alex in his battles. Alex is challenged physically and emotionally when the unexpected happens. Penny is not put off by Alex's change in behavior. She decides to fight her own battle to help him. 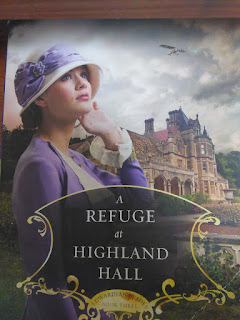 I enjoyed the setting of Highland Hall and the main characters, Alex and Penny. There are other subplots going on that make this book even better. A servant and a German prisoner...a wife and husband separated during a difficult pregnancy...a young wife's desire to have a child after multiple miscarriages...and managing house full of children at Highland from London. All of these things created a story that I was happy to read. What's better than a knight in shining armor? A woman in shining armor! Gwendolyn Barnes of North Britannia is a noble woman who prefers to be a knight and fight. This story is set in England in the 12th century. A noble woman's purpose at that time was to marry, but not for love. If the family can gain status or fortune through a marriage then it was her job to follow her father's wishes. Allen of Ellsworth grew up as a peasant, but he was ready to become a knight under the care of Lord Linden. He heads to North Britannia to start a new life and fulfill his dreams. North Britannia was a different type of place because it was known "for its adherence to the law and Christian charity". Allen said, " I was told that Duke Justus honored nobility of heart above nobility of birth." Allen was not given a title by birthright, but his actions to serve God and others made him a noble knight. This book is classified as teen fiction, but the audience for this book is not limited to teenagers. Adults who like a clean read with romance and some action will enjoy this book. I enjoy stories about noble knights fighting for honor and justice for all. The fact that the Lady Gwendolyn has the skill to fight for herself and others makes this book that much better. I received this book from Bethany House Publishers to read and offer an honest review. The book image contains an affiliate link. Called to Pray by Linda Evans Shepherd could also be called Inspired to Pray. This book is about answered prayers. Reading and hearing about God answering another person's prayer is a powerful testimony and motivator for the rest of us. After reading this book, you will remember to "trust in the Lord with all your heart" like it says in Proverbs 3:5. The author wants us to pay attention to the promptings of God to pray for ourselves and others. She created chapters to show us that we are called to pray for protection, rescue, needs, souls, breakthrough, guidance, miraculous wonders, encouragement, trust & faith and others. You pray and trust God to handle the rest. He does not always answer in the way you expect, but His answer is perfect. I like the story of Todd, the college student who had a loan payment of $300 due soon. He remembered the testimonies of others who received money in the mailbox just in time to meet the need. So he thought God would do the same for him. Did God provide for him? Yes! He gave him a paint job that paid the exact amount he needed. It would have been easier to just receive in it his mailbox like others, but God answered his prayer. The story was an example of asking for something and expecting to receive it a certain way. Then God throws a curve ball to answer your need differently than you expected.. His ways are not our ways. You can read this book straight through in order like you would a fiction book. You can also read any prayer story out of order for just a few minutes. It is a great way to start or end your day. I recommend this book for yourself and as a gift to someone else. I received a copy of this book from Revell publishing for an honest review. The book image is an affiliate link. Read my disclosure page. Double Trouble by Dandi Daley Mackall might grab your attention because of the cute horse on the cover. This I Can Read book published by Zonderkidz has an important message about the truth and taking responsibilities for your actions. Jen loved riding her horse, Bob. One day, she rides Bob into a Mrs. Gray's flower garden. It was not on purpose, but the flowers are ruined. She decides not to tell Mrs. Gray. "It was such a little thing" so why not keep quiet. Later, her horse starts to have a problem while walking. The vet figures out the little thing that is causing a big problem. Children can learn that not admitting when you are wrong is no small matter. It affects you and the person you hurt. Young children and parents will enjoy this short story and beautiful illustrations. Luther and Katharina: A Novel of Love and Rebellion by Jody Hedlund is about Martin Luther and his wife, Katharina. Martin Luther began the Protestant Reformation in Germany in the 16th century. Luther was a former monk and preached against the Catholic church. He was considered an enemy of the church. He thought he could be killed at any time. Katharina von Bora was a nun at the time she read Luther's writings. She became convinced that she could still serve God while not living a cloistered life. Katharina and some of the other nuns decided to run away from the abbey to start a new life. Luther became responsible for the runaway nuns. His goal was to find them a "suitable" man to marry or at least become employed by a family. Katharina's goal was to get married and have children. It did not seem like they would be suitable partners in love and ministry to each other. Love bloomed between Luther and Katharina in the midst of external persecution and their own internal reservations about each other. There are many parts of the story that stand out. One thing is Katharina's prayers. Although she left the abbey, it still took her time to shed her past life. Her prayers in the book shows how her relationship with God was maturing. I loved this story because of the history. I loved this story because of the spiritual and emotional transformation of Luther and Katharina. I did not know much about Martin Luther. While reading this book, I searched for more information about Luther and the Reformation. Historical fiction is at its best for me when I want to go beyond the story and read the history. I have already recommended this book to my local library who plans to order this book for circulation. I have talked about it with my friends. Do I like this book? Absolutely! You will want to read more books by Jody Hedlund. Go to her website to discover her other books. The Hearts of Faith series are about real people (missionaries and preachers). 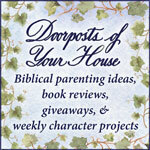 You will want to dig deeper to find out more about the people she writes about. I received this book from Blogging for Books for my opinion about this story. The book image is an affiliate link. Read my disclosure page for more information. Anger is a normal feeling. What happens after we get angry can get us in trouble. Teaching Christ's Children About Feeling Angry by Corine Hyman uses beautiful illustrations and the Word of God to help kids know the best way to respond to anger. The story is told by a young girl, Tayniesha, who tells us about the times she gets mad. Her brother teases her or she is told to stop something she wants to do are some reasons why she gets so upset. Tayniesha does not handle her anger in the best way. Her mom makes a wise choice and shows her daughter scriptures so she can learn how to handle her anger. Her mom lets her daughter know that feeling angry is okay, but we must not sin. This book is right on time for my family. I have 10 year old boy/girl twins and a 6 year old daughter. We are dealing with how to handle our anger. I want my kids to know that anger is normal and okay. God shows us the best way to deal with such a powerful emotion. I believe most children can relate to the girl in this book. The situations she talks about are real and it's just enough to get your child to open up about their angry feelings. This book will help me reinforce what my family has been discussing recently. God's Word is powerful and this book uses scripture references and a short story to help our little ones to be their best. The book cover image will take you to this book on Amazon and it is an affiliate link. Read my disclosure statement for more information.